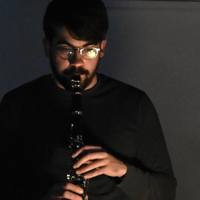 ZACHARY GOOD is an instrumentalist (clarinets and recorders) and performer from Pittsburgh. Based in Chicago, he is a freelancing musician, educator, and founding member of the performance group Mocrep. He has enjoyed performing with the International Contemporary Ensemble, Eighth Blackbird, Third Coast Percussion, Ensemble Dal Niente, Lyric Opera Unlimited, Manual Cinema, the Civic Orchestra of Chicago, and the improv trio ZRL. He is a band director at the Chicago Waldorf School. Zachary is a graduate of Oberlin and DePaul.